Earlier this week I published a post about Read Write Think's theme poem online activity. Obviously, that activity is a great fit for a language arts lesson. RWT is known for language arts interactive activities and templates. Dig a little deeper into RWT and you'll find interactive activities, apps, and templates that can be used in science and social studies lessons too. Read Write Think offers a good interactive guide that can help students craft a good persuasive essay. The Persuasion Map asks students to start with a thesis statement before walking them through developing support for that thesis. Students can print their persuasion maps or email them to you. RWT offers a number of lesson plans that incorporate the Persuasion Map. You can find those lessons here. Essay Map provides students with step by step guidance in the construction of an informational essay. Some of my students seem to struggle most with constructing an introduction and conclusion to their essays. Essay Map is particularly good for helping students visualize the steps needed to construct good introductory and conclusion paragraphs. After students complete all of the steps in their Essay Map they can print their essay outlines. Read Write Think's Crossword Puzzle Generator makes it easy to create your own crossword puzzles. To create your puzzle simply enter a list of words, a set of clues for your words, and then let the generator make a puzzle for you. You can test the puzzle before printing it. You can print blank puzzles and answer sheets from the puzzle generator. Alphabet Organizer is a great little tool from Read Write Think that students can use to create alphabet charts and books. The idea behind Alphabet Organizer is to help students make visual connections between letters of the alphabet and the first letter of common words. In the video below I demonstrate how to use this tool. RWT Timeline is available as a web app (Flash required), as an Android app, and as an iPad app. All three versions make it easy for students to create a timeline for a series of events. In the video below I demonstrate how to use the web version of the RWT Timeline creation tool. RWT's Animal Inquiry guide is a good fit for elementary school science lessons. Animal Inquiry provides students with four templates; animal facts, animal babies, animal interactions, and animal habitats. 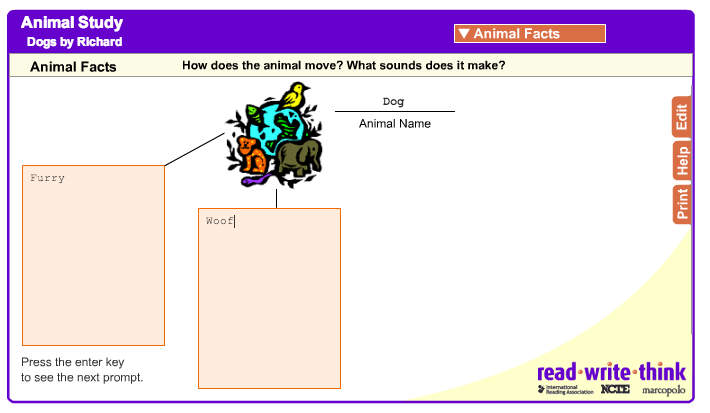 Each template is an interactive template in which students respond to three prompts to help them create short reports about animals they are studying. Read Write Think suggests using the questions in the Animal Inquiry template as prompts for research. The questions in the templates could also be good for helping students brainstorm additional questions to research. Read Write Think offers a free program called the Profile Publisher. Profile Publisher allows students to create and print mock-ups of social network profiles. Students can create profiles for themselves of for fictional characters. Profile Publisher includes fields for "about me," "blog posts," "interests," and all of the other profile fields typically found on a social network. Completed profiles can be printed. The RWT Flip Book app is available for iPad, for Android, and for use in your web browser (Chrome or Firefox is recommended). RWT Flip Book lets students create books by typing or by drawing on the pages in their books. There is a variety of page templates that students can choose to use within their books. Some templates are text-only, some are drawing-only, and some are a mix of drawing and text templates. To use RWT Flip Book students simply open the app, enter their first names, then start creating their first pages. Read Write Think's Word Mover app for iOS, Android, and web browser helps students develop poems and short stories. When students open the Word Mover app they are shown a selection of words that they can drag onto a canvas to construct a poem or story. Word Mover provides students with eight canvas backgrounds on which they can construct their poems. If the word bank provided by Word Mover doesn’t offer enough words they can add their own words to the word bank.